Third baseman Jace Williams went 4-for-8 from the plate in three games at Arizona. She also drew five walks. Yesterday evening, the No. 5 Cal softball team gathered in Haas Pavilion with friends and family to watch the NCAA Selection Show. The regular season was over, and there wasn’t much left for the Bears to do but sit back, waiting to find out where they would travel for their 26th consecutive postseason. After all, they had earned the rest. A day earlier, the Bears with a 6-3 win at No. 10 Arizona, taking two games of their final Pac-10 series. The performance capped a resume that led to a No. 7 overall seed in the NCAA Tournament and a spot in the Louisville Regional this week. Cal (39-10, 15-6 in the Pac-10) shut down the Wildcats in Saturday’s rubber match, blasting four runs in the top of the sixth inning. The Bears blanked Arizona through the last three frames, finishing with their best conference winning percentage since 1995. Their second-place standing is also the highest since 2005, when the team tied for the Pac-10 title. Cal’s weekend at Farrington Stadium didn’t start off quite as well. 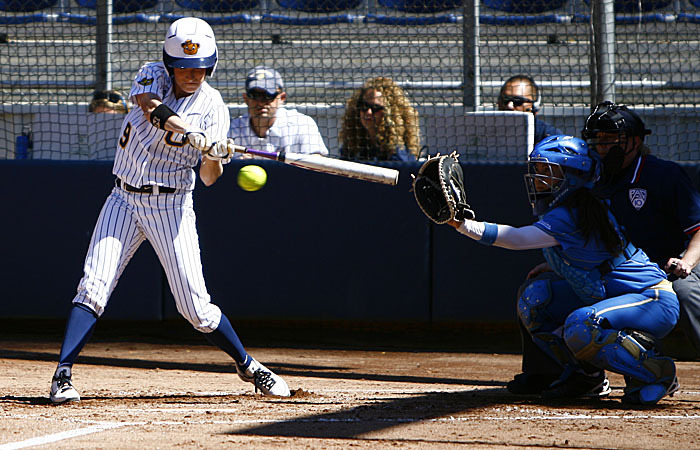 Bears’ pitcher Jolene Henderson struck out 11 in 9 2/3 innings in Tucson, Ariz., but gave up a walk-off single to Wildcat shortstop Ashlee Brawley. The 2-1 loss broke Cal’s eight-game winning streak. The Bears wouldn’t let Arizona (40-16, 11-10) eke out another win, increasing their own run total nearly tenfold on Friday to even the series. Cal erupted with four runs in the top of the first inning. Outfielder Jamia Reid led off with a single, stealing second and advancing to third on a wild pitch. More small ball moved the Bears along the bases, and the entire lineup went up to bat before Reid lined out to end the frame. When the lead shrank to 5-4, the Bears reeled off another four runs in the sixth inning to clinch the win. Freshman Arianna Erceg started in the circle on Saturday, giving Henderson — who has pitched more innings than any other player in the Pac-10 — some rest before the postseason. Erceg, who entered the game with 40 1/3 innings of work to Henderson’s 275 1/3, walked three and allowed three runs in five frames. But Cal’s bats were enough, with the top four in the order combining to go 9-of-16 at the plate. Another four-run sixth dug the Bears out of a small 3-2 deficit, and Henderson pitched two innings of scoreless relief to keep the final tally at 6-3. The Bears will return to the field on Friday at 2 p.m., facing Jacksonville State to kick off the double-elimination first round.